Egypt’s State Information Service (SIS) on Sunday launched a website portal in six languages, Arabic, English, French, Swahili and Hausa with the Amharic Language to release days later, as part of an effort to open further communication with Africa. Chairman of SIS Diaa Rashwan explained in a statement that this portal is the largest serious attempt to communicate with the African people in their local languages in addition to the European languages spread in the African continent, and the Arabic language. Rashwan said that the portal comes as part of wide media activity carried out by SIS in order to achieve the objectives of the government in strengthening Egypt’s relations with the people of Africa, especially after President Abdel Fattah al-Sisi assumed chairmanship of the African Union (AU). He stressed that this media activity will continue and is not limited to the period of Egypt’s AU chairmanship. The SIS Chairman said that the portal also encourages Egyptians to be more aware of African countries, Egypt’s relations with them, their news, cultures, symbols, literature, economies, histories and civilizations. The portal also addresses all African people in languages ​​that they can read, thus helping every user to find all news on their country, reports and news about the Egypt’s relations to their country and collective actions among other African countries throughout the year. Rashwan explained that each one of the six versions of the portal contains about 10 categories that will be updated daily, most important being Egypt’s category, which provides Egypt’s basic information such as an overview of the history of Egypt, information on the political system and daily news about Egypt in all fields. 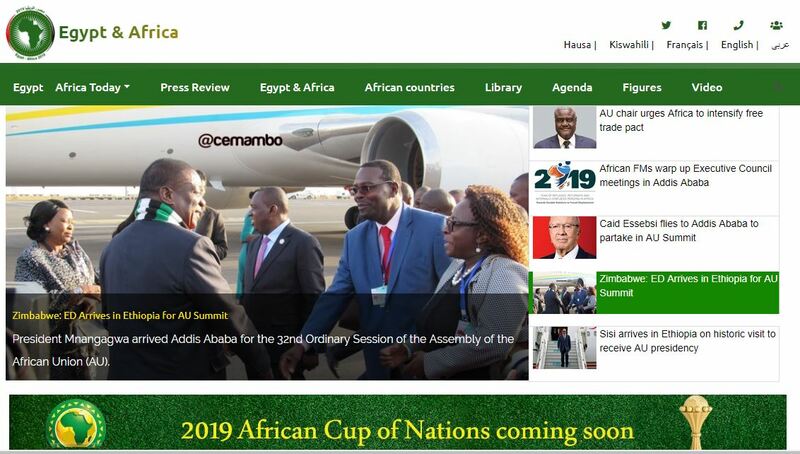 The portal will also include the category “African countries”, presenting background information on African countries as well as the most important daily news of each country, and “Africa Today”, containing the most important news on Africa.